If you have implemented Incapsula as part of a web application security plan, you probably know that they provide several web application security services including a web application firewall (WAF), DDoS protection, and content delivery. Those are valuable layers of a web application security plan, and can help enhance uptime and speed up availability of your business’ web services. However, these products from Incapsula and their competitors (including Cloudflare, Akamai, Cloudfront, and KeyCDN) do not provide a complete security solution. They are part of a comprehensive security strategy, but you still need a security tool to test the web applications sitting behind them and identify vulnerabilities that can be found and fixed before the application goes online in the first place. Acunetix gives you that layer. It is an enterprise-grade website security scanner that lets you know exactly what security flaws your company’s web applications have. It provides the strong foundation that you need for your security platform: up-to-date, accurate, and on-demand knowledge of what security vulnerabilities you need to fix in your web applications. Though web application firewalls, DDoS mitigation, and content delivery networks provide an additional layer between your network services and Internet threats, they are not complete solutions but rather individual lines of defense for the sensitive data behind your web applications. Skillful attackers know to look for them, and their tactics for circumventing them are improving every day. Though they can make it more difficult for some attacks to succeed, they are not foolproof. Thus, you need to make sure that the web application behind these layers has been thoroughly tested for vulnerabilities. 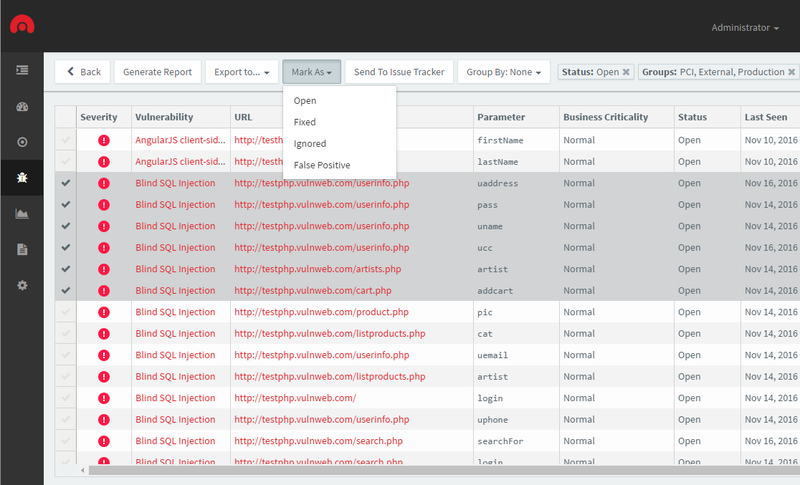 As a full-featured web security scanner, Acunetix does just that. No matter what client-side or server-side technologies your web applications use, it works. Its DeepScan technology accurately crawls and maps out any kind of web application, from open source content management systems like WordPress to custom applications. It identifies critical vulnerabilities that make websites vulnerable to application layer attacks: SQL Injection, Cross-site scripting (XSS), and Remote Code Execution (RCE). Acunetix also identifies other flaws like untrusted or expired TLS/SSL certificates, web server misconfigurations, and weak passwords that may fall victim to brute force attacks. All this adds up to a clear view of the web security posture of your large or small business, as well as the tools and knowledge you need to secure your web applications. Acunetix fits with any kind of business infrastructure. For those who prefer cloud security solutions, Acunetix Online gives you the full power of our web security scanner from a secure cloud portal. For those who prefer to run security tools from servers located in their own offices or data centers, Acunetix has options. In addition to a Microsoft Windows version, we have recently released a version of Acunetix vulnerability scanner that has been engineered from the ground up to run on Linux. No matter what technologies your business depends on, now or in the future, you can trust Acunetix to work with your environment and provide a solid foundation for your web security platform. Every version gives you all the advantages of Acunetix: industry-leading speed, full-spectrum vulnerability scanning, low false positive rates, and flexible reporting options.